The Miss World Guyana 2019 pageant has been shifted to 2020, a statement from the organisation on Tuesday disclosed. Majesty International, the holder of the Miss World franchise said that the decision was made to shift the timeline of the pageant to ensure that candidates have a better chance of competing on the national and international stage. With the shift, candidates will be provided a preparatory period, which will allow them to “gain the confidence that is required to become the face of Guyana”, and give them time to “build more visibility, add value, boost confidence, build character and the resilience for each journey to be more meaningful”, the organisation said. “The organisation is now accelerating a global restructuring programme to build on the progress the Miss World brand has made in executing social programmes to best serve the Guyanese community on a long-term basis. The restructuring will also give the organization opportunities to foster personal and professional growth among young people and create marketing opportunities to bring differentiated value and innovation to related industries,” the statement related. “The 2019 Miss Guyana’s application and recruitment campaign returned an overwhelming response to the recruitment cycle with 73 entrants and 65 active and potential candidates of which a total of 30 received invitations to the casting call worldwide. The casting call was postponed facilitating an improved programme that would better prepare all entrants for success at every level of the journey regardless of their circumstances or outcome. We are committed to building the confidence of our youth by taking this task even more seriously and as a result, National Director, Natasha Martindale took the initiative to shift the timeline for 2019 competition to 2020 whilst addressing some key recurring issues directly impacting the quality of journeys every year,” it was stated. 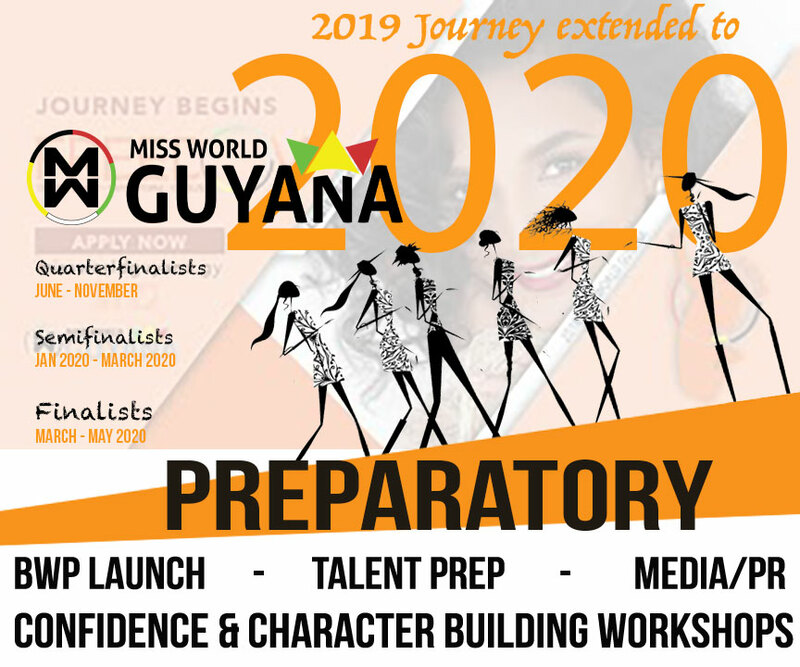 The franchise further noted that as a result of the restructuring, the recruitment cycle for Miss World Guyana 2020 has been extended to May 15, and so they are inviting those who planned to apply for the 2020 journey to do so at www.missworldguyana.gy or via their Facebook/Instagram pages. It was noted that candidates who already applied and were invited to the casting call, do not need to reapply and are currently being reevaluated as quarterfinalists on submission of their paperwork. The 2020 quarterfinalist journey is to be announced in May. “Although the decision to delay the competition was not an easy one, the organisation believes it is one that would better promote cultural heritage and social cohesion throughout our regions; create well rounded role models that other young people would emulate –especially since approximately 57% of the people in Guyana are under the age of 26; and, drawing on best practices to determine how we can all work together to a present a more youthful presence as the face of our country to boost tourism across the regions and added value to all partners,” the organization noted. It was added that the Miss World Guyana organisation is currently finalising a multi-million dollar prize package, including a cash prize of $1 million for Miss World Guyana 2020, and a USA & UK/Europe media tour promoting Guyana and Guyanese brands internationally.